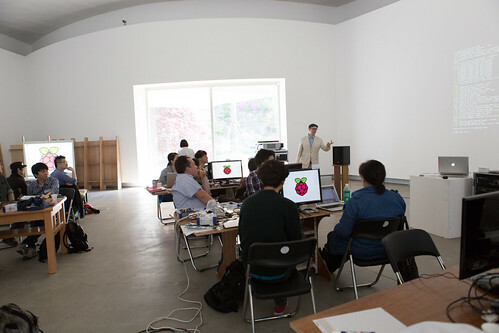 On a sunny Saturday on the 11th of May, MadLab was invited to speak and run a physical computing workshop for Anyang Public Art Project (APAP)’s Making Lab (만들자 연구실) in South Korea. It was a wonderful experience meeting people from the other side of the world who are into creative technologies as much as MadLab. Founded in 2005, APAP is a “public art event organized by the city government of Anyang for re-imagining the ways people make sense of the city”. 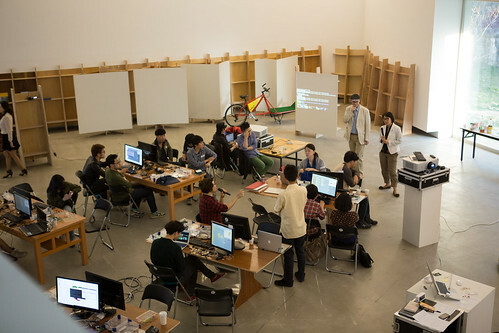 Organised by Taeyoon Choi, Making Lab is a pilot makerspace within APAP, with workshops, presentations and activities planned through the year. APAP is situated near the base of a popular hiking trail and is frequented by schools for field trips. It’s ideally located to engage with members of the general public who might not know about maker culture. I gave an introduction to MadLab and Manchester for the first half, and Dave ran a hands-on Raspberry Pi and Scratch workshop in the latter. Most people in Korea only know Manchester for its football (mostly because of Park Ji-Sung), so I started with some background about Manchester’s industrial heritage and the creative digital industry in my talk. There has been a parallel movement within Korea to start and run hacker/makerspaces in the past few years, evident from the number of spaces running under a make and share model. MakerFaire Korea will also run for the second time this weekend (1st June). Most of these spaces lacked the democratic non-membership model of MadLab, and perhaps did not have the diversity of people who come to MadLab. MadLab’s all-inclusive ethos of creating an environment for people from diverse backgrounds to meet and collaborate might be the missing piece in Korea’s makerspace initiative. 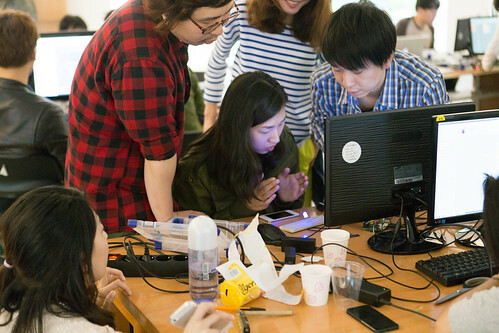 The free physical computing workshop was attended by people from various backgrounds. The 22 workshop attendees were from various skill levels. Most had some experience with microcomputers, some had never heard of the Raspberry Pi. There was even a young boy who raced ahead of the tutorials, and would fit right in with CoderDojo. We tried to make it a welcoming environment with some snacks and wordplay. We went through the setup of the Pi, and an introduction to Scratch. The main aim of the workshop was to get an LED responding to a little programme in Scratch, and we were lucky to have Seungbum Kim in the audience. He’s translated the easy to use visual programming toolkit into Korean, so was able to give others a hand. Although most people could understand enough English to get by. All in all, it was wonderful to make new friends and spread the work of MadLab abroad. I hope it’s the beginning of new collaborations. The lineup of activities for the rest of the year look brilliant too. If you’re around that neck of the woods, I’d recommend a visit. Anyang is a satellite city of Seoul, about 20 miles south of Seoul.